Ferrite Magnets – International MagnaProducts, Inc.
A ferrite magnet is made up of two chemical compounds magnetite and hematite, magnetite is actually the most naturally occurring magnetic mineral found on the planet which is why ferrite magnets are so affordable. There are a number of different categories and ways to categorize ferrite magnets, so it is best to know what you are looking for before purchasing or to consult with an experienced ferrite magnet manufacturer. 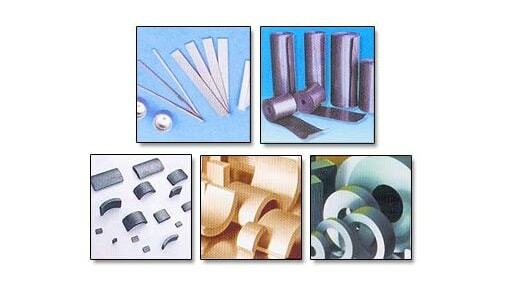 In general, ferrite magnets are put into two different categories, soft ferrites and hard ferrites. In order to categorize them, their magnetic coercivity (persistence of internal magnetism) is evaluated. Unlike most substances, hard and soft has nothing to do with the brittleness of the magnet as both categories are rather brittle. Instead, it has to do with the amount of coercive force the magnet produces. Because this kind of magnet can be split into these two categories, they are incredibly versatile and can be found in many different applications and industries. Each type is ideally suited for different applications. For example, you might find a hard ferrite magnet within a hard disk drive or radio due to the greater amount of coercive force needed, while on the other hand, a soft ferrite magnet is would more likely be used in applications like electromagnetic cores or transformer cores where coercive force is not as important. So while a ferrite magnet may be far simpler than an alnico or neodymium magnet, it is important to know that there are still a number of options and factors to consider. This is why it is so crucial to find a trusted, experienced ferrite magnet manufacturer, ensuring that you receive the best possible solution for your unique applications. Ferrite Magnets When you think of magnets, ferrite magnets are probably what you think of first because they are the most common and most affordable type of magnets. Not to mention that they are heavily involved in children's toys and television shows.